Our room darkening skylight shades are an excellent way to block unwanted light from entering through skylight windows. Designed with no holes privacy, our skylight blinds and shades block more light than standard pleated shades. Ideal for energy savings, these blackout shades for skylights are a great way to insulate your windows. Total shade area must not exceed 18 square feet. Skylight shades are cordless and may require a pole to operate in hard to reach windows. Do the skylight shades have a track system for the sides? I have seen some in the stores which require tracks. The Pleated Room Darkening Skylight Shades have tension cords that run along both sides of the shades to keep them from bowing. If i am installing it in a skylight, how do i avoid the cord? does it have a handle? When installing the skylight it is cordless and has a handle not a cord. If you cannot reach the skylight you will need a pole. How do you moount the skylight shades so they don't sag? Our skylight shades have cords running through them so they will not sag. Love them. Made huge difference in heat. Glad they were made in the USA! They were easy to install and fit perfectly! Not very difficult to install. Not very difficult to install. Just measure carefully. I had to undo and retire both sets of blinds as the tension was much too loose and the blinds sagged considerably even when fully closed in the skylight opening. I had to undo and retire both sets of blinds as the tension was much too loose and the blinds sagged considerably even when fully closed in the skylight opening. In hindsight, blinds that came with side channels would be preferred way to go. Size was perfect, easy installation, and color is great. 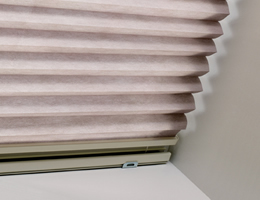 The instructions are not clear about how to remove the blind once installed, or if it needs adjustment. It would be nice if the blind could latch and stay fully closed. The best part of the experience was the recovery by Hannah in your customer service. The best part of the experience was the recovery by Hannah in your customer service. The package was stolen from my front porch and when I explained the timing need--your entire team exceeded by expectations by getting a new custom made shade sent pronto. Thanks!